Ace Star Weddings has a large fleet of self drive and chauffeur driven vehicles available to hire. We are the perfect choice when it comes to wedding car hire. 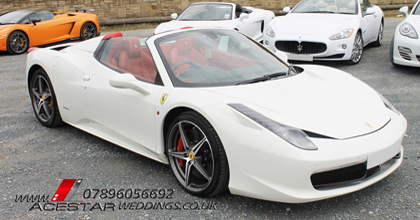 The wedding cars we offer can be used anywhere in the UK, including the North, Midlands and South of England. Our drivers are all professional, friendly and experienced chauffeurs.They always aim to make your journey and drive as easy and comfortable as possible. Below is a list of some of the vehicles available for wedding car hire. At Ace Star we do not cross hire our wedding cars. Therefore they are always kept in immaculate condition. Not only this but because our fleet is actually OUR fleet and not cross hired. You can be sure to receive an honest reliable service with no need to worry about the issues arising from cross hiring! Here at Ace Star Weddings we encourage all our clients to come and view not only OUR vehicles but ANY vehicle before you book. There are many reasons for this such as making sure whoever you book with actually can provide you with the vehicle(S) they are offering. It has become too common for us to receive phone calls from distressed family members hours before a wedding because they have been let down. After all you would not book a venue without viewing so always make sure u have been to see the company and cars you are booking to make sure you are happy with everything. Tyne and wear- Newcastle upon Tyne, Gateshead, north Tyneside, south Tyneside, Sunderland. Nottinghamshire -Ashfield , Mansfield, Long Eaton, Newark. Leicestershire, Charnwood, Melton, Harborugh, Oadby, Wigston, Hinckley and bosworth. Barking Dagenham, Barnet, Bexley, Brent, Bromley, Camden, Croydon, Ealing, Enfield, Greenwich, Hackney, Hammersmith and Fulham, Haringey, Harrow, Havering, Hillingdon, Hounslow, Islington, Kensington and Chelsea, Kingston upon Thames, Lambeth, Lewisham, Merton, Newham, Redbridge, Richmond upon Thames, Southwark, Sutton, Tower Hamlets, Waltham Forest, Wandsworth, and Westminster. Hampshire- Fareham, Gosport, Winchester, Havant, East Hampshire, Hart, Rushmoor, Basingstoke and Deane, Test Valley, Eastleigh.New Forest. Southampton,Portsmouth. Kent-Dartford, Gravesham, Sevenoaks, Tonbridge and Malling,Tunbridge wells. Maidstone, Swale, Ashford, Shepway, Cantebury, Dover, Thanet. Oxfordshire- Oxford, Cherwell, South Oxfordshire, Vale of white Horse, West Oxfordshire.